Ambient master Lucette Bourdin returns to Earth Mantra, this time with a stunning collection of eight ambient pieces, all inspired by a poem by Walter de la Mare. And 'inspired' is exactly the right word to use. We have long been fans of the music by this California-based artist, but with each release she seems to outdo herself. This collection is no exception. It is, in fact, the best work we have ever heard from Lucette Bourdin, and folks that is REALLY saying something. This release is composed of eight pieces of sheer ambient perfection. There are many influences evident in her work, from both space music (think Serrie) and traditional ambience (think Roach), but Lucette's genius is her ability to incorporate diverse influences while always firmly stamping her own distinct voice upon the final result. The music is lush and beautiful, incredibly soothing, and yet without the syrupy sweetness that sometimes accompanies light ambient music. What really sets the album apart is the sound design, which is both understated and yet thoroughly refreshing and original. Mesmerizing and hypnotic, and yet equally suited for active listening and enjoyment. As we said, genius. 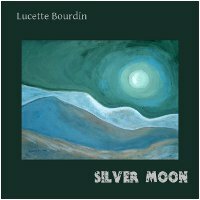 With Silver Moon, Lucette Bourdin firmly establishes herself as one of the top artists in ambient music, at any level. We are pleased as can be to be bringing this beautiful album to our listeners, one that is sure to be one of the top releases of 2009. Top 20 for April 2010 on WVKR Secret Music. Lucette is one my favorite drone ambient artists. I'm always looking forward to her work.